Finding new clients is one of the biggest challenges facing coaches, which is why we have updated the Coach Search and Coach Profile. A properly filled out Coach Profile makes you more discoverable by thousands of athletes looking for a coach, and is also a powerful tool you can use to proactively find more clients. Think of this page as your own brand, showcasing your abilities and expertise. Use these best practices to optimize your profile, effectively use your Personal URL, and start growing your business. To access your new Coach Profile, open your settings, then click on the public profile editor text. Your personal URL can be shared on your website, social media channels, newsletter, etc. allowing you to proactively market your business. Use this URL to send athletes directly to your profile so they can easily view your summary and bio. Even for coaches who have a website, your personalized page can drive new traffic that your website may miss. Coming soon, the Coach Profile will also have a Training Plans tab that will display all the training plans you have for sale. Since this URL affects all search engine results, it is important to consider what you name your URL. We recommend you use your personal or business name. To help search engines find your profile, it is important to use hyphens between each word. If your business or personal name is taken, think of how athletes would search for your services. For example, John Smith may want to use John-Smith-Triathlon-Coaching. The summary is very important and serves as your chance to sell yourself to potential athletes. Your summary is shown to athletes searching in TrainingPeaks and any search engine. It should be a quick description that lets athletes know what you are about and how you can help them reach their goals. The bio is the place to list your certifications, TrainingPeaks Level 2 accreditation, experiences, services offered, and other information. Here you can talk more about your history, personal racing, love of the sport, and even offer testimonials from previous or current athletes. 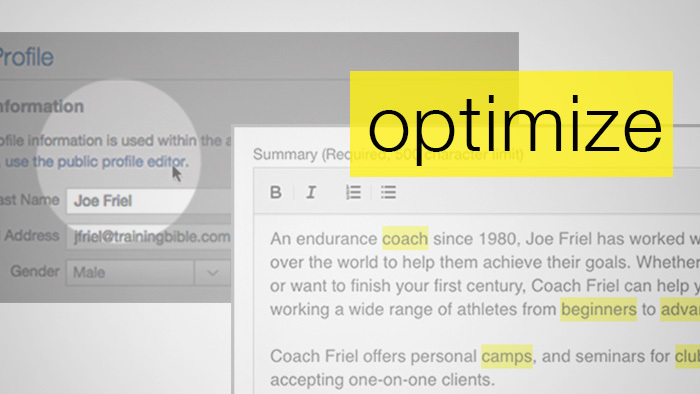 Using the right keywords in your summary and bio is one of the most important things you can do to help athletes find your business. By using specific words, your profile will rank higher among all search engine results pages. The summary below is a good example of how to quickly and effectively tell athletes about your business and use keywords. First impressions are very important, and your profile visually represents you and your brand to potential athletes. Using a good headshot shows you care about the details. A good image is one that shows your face and has positive body language. The image you select for your Coach Profile can be different from the one displayed on your TrainingPeaks Coach Account. Social media is an alternative way for athletes to research your business. Many athletes will look to get a better understanding of you and your business by looking through your Facebook or Twitter account. Adding your Facebook, Twitter, and Linkedin accounts to your page to make it easy for athletes to find out more about your business. Log in now to update your profile. Dave Schell is the Director of Education at TrainingPeaks University. He coaches triathletes and cyclists of all levels from beginner to pro to achieve their highest potential. When Dave isn't traveling the world teaching others how to better use TrainingPeaks, he's trying hard not to fall off of his mountain bike.